<Wakame> The sea vegetables wakame and nori has been a part of the Japanese diet since ancient times. Wakame is found on the Pacific coast of Japan anywhere south of the town of Muroran in Hokkaido, and on the Japan sea coast on the coast line of Hokkaido. Sanriku, Naruto and Izumo are particularly famous harvesting grounds for wakame. Most wakame is preserved, either by being dried or salted. It is often used as an ingredient in miso soup and vinegared salads called sunomono. Glutamate, an umami substance of wakame, is more abundant in wakame shoots than the leafy parts. 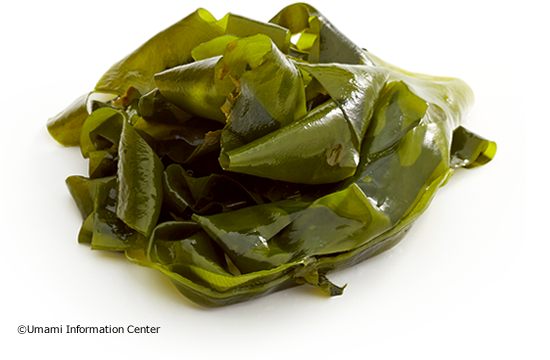 Nori is the Japanese name for an edible seaweed species of the red algae genus Pyropia including P.vezonensis and P.tenera. It is cultivated around the coast and harvested from November to April. 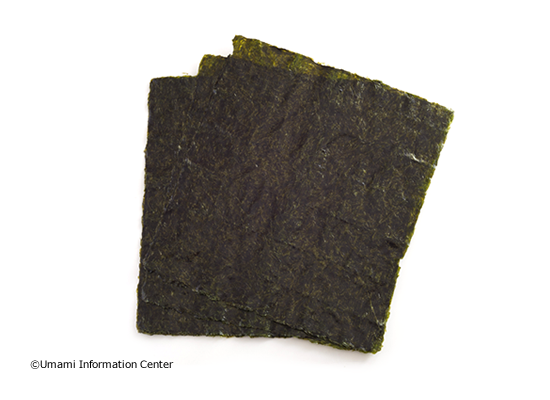 Thin film-like nori is cut into small pieces and dried into sheets. “Hoshi nori” is just dried. “Yaki Nori” is baked at a high temperature for a very short time. 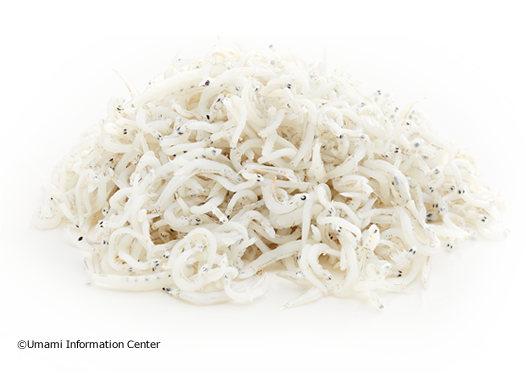 “Ajitsuke Nori” is seasoned nori and is also popular on the market. Nori had been consumed in a paste form until the sheet form. It contains nucleotides, inosinate and guanylate as well as glutamate. 1. The fish is filleted into three, which is called “kame bushi (turtle block)” from its shape. In case of a fillet being big enough, cut it into two pieces. In this case, two pieces has individual names. The upper piece on each side is known as obushi (“male” block), and the lower as mebushi (“female” block). Each piece is also called honbushi. 2. The fish is simmered to set the proteins, before being cooled. 3. The fish is soaked in water then the scales, skin and bones are removed by hand. 4. The pieces of fish are then repeatedly smoke-dried and cooled down. This completes the process for arabushi. 5. 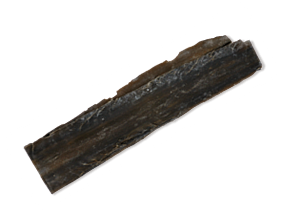 The surface of the dried blocks is shaved to remove the tar that has build up during smoking. 6. After inoculation, the blocks are left to dry. This is repeated up to three times to make karebushi. If the process is repead more than four times, the superior quality block created is known as honkarebushi. This inoculation process reduces fat and the smoked flavor and adds aroma to produce honkarebushi. The fushi is then shaved by special shaving utensils and is used for dashi. In Western Japan, they also like dashi made of arabushi, which is koku-rich. With obushi (“male bushi”) that contains less fat, purer dashi can be made. Ichiban dashi (first-brewed dashi) made of glutamate-rich kombu and inosinate-rich katsuobushi delivers the most effective synergy of umami. Thus, dashi is a base of Japanese cuisine. 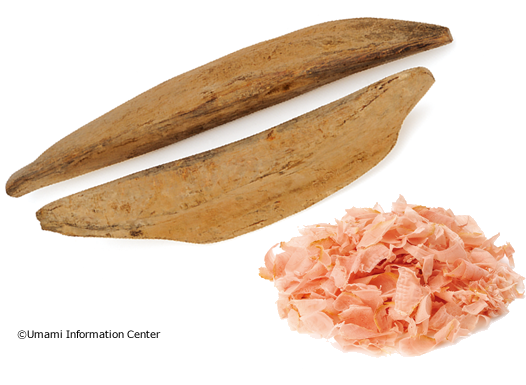 Ryotei, high end Japanese restaurants, may use maguro (tuna) bushi instead of katsuobushi. With maburobushi, a delicate and pure dashi can be made. Niboshi are small sardines that have been boiled and then dried. 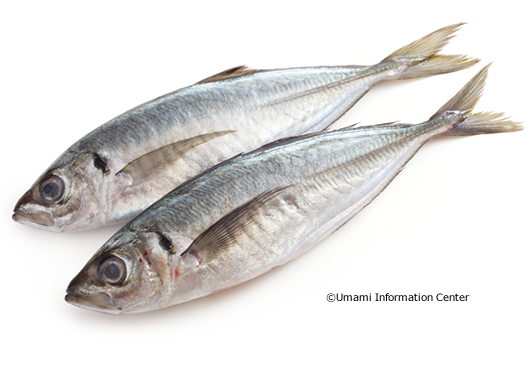 The most popular ones for niboshi are anchovies but other small fish such as sardines are also used. They are mostly used to make dashi (Japanese stock). The stomach and head often carry a bitter flavor, which is why it is best to remove them. The amount of inosinate of raw fish decreases with time. In the boiling process of niboshi manufacturing, the enzyme which decomposes inosinate becomes inactivated, thus there is much inosinate in it. The drying process, which comes later on, also increases umami because of dehydration and concentration. Miso is abundant in glutamate, so that an umami synergistic effect occurs in miso soup with niboshi dashi. 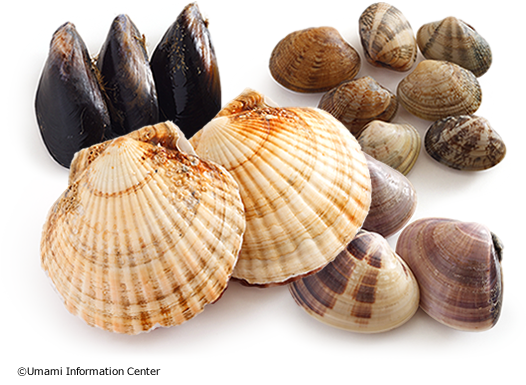 A general term for a variety of soft bodied, shelled sea creatures, including clams, scallops and mussels. Some shellfish cannot be eaten raw and must be cooked first. All are rich in nutrients, including taurine and calcium. In particular, scallops contain high levels of a number of various amino acids, and are used in a wide range of cuisines such as Japanese, Western and Chinese, as a rich source of umami. 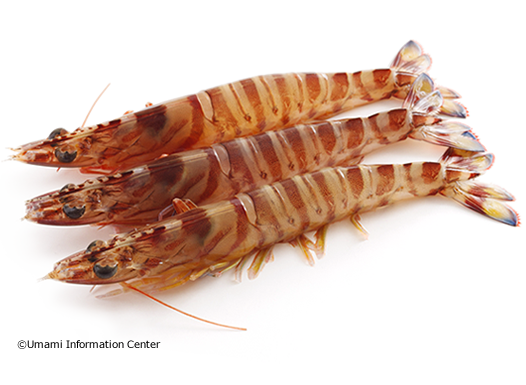 Many varieties of these crustaceans are found around the world, and have been enjoyed since ancient times. It is a convenient ingredient to use, and is used abundantly in many cuisines around the world, including French, Chinese and Thai. 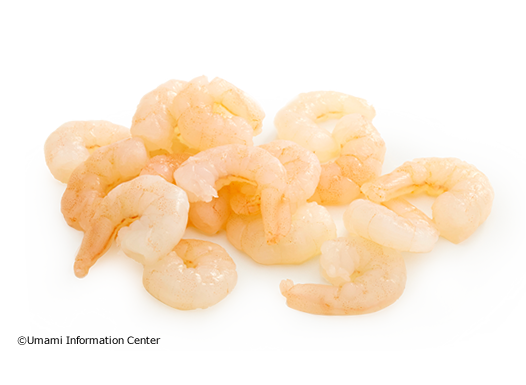 Shirmps and prawns contain an amino acid called glycin, and this, combined with glutamates and inosinates, serve to create a unique umami taste. South East Asia is home to a number of fermented seasonings made from shrimps and prawns, all of which are rich in umami. The reproductive glands (testes, ovaries) inside the spiny shell are eaten. 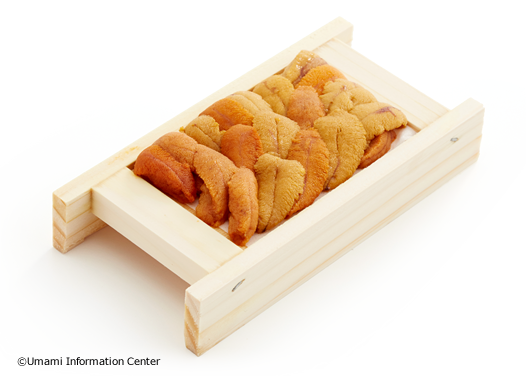 The ezobafu sea urchin, the purple sea urchin, the red sea urchin, and the bafun sea urchin are enjoyed. The bafun sea urchin is considered to be particularly tasty. Sea urchins contain a lot of the umami compound glutamic acid. One variety of amino acid, methionine, is also contained, and this methionine plays a significant role in the unique flavor of sea urchins. A general term for cuttlefish and arrow squid. 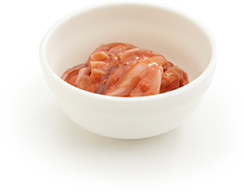 No part of the squid is wasted, from the flesh to the ink, and it is prized for its ability to be preserved in dishes such as shiokara (salted internal organs) and surume (dried squid). The white substance found on the surface of surume is in fact a type of amino acid called taurine. World-wide, while the Jewish religion forbids the consumption of seafood without scales such as octopus and squid, they are both popular in Mediterranean cooking. It imparts the bitterness of histidine and hypoxanthine as well as sweetness. Thus it is preferable in cooked dishes rather than raw ones. 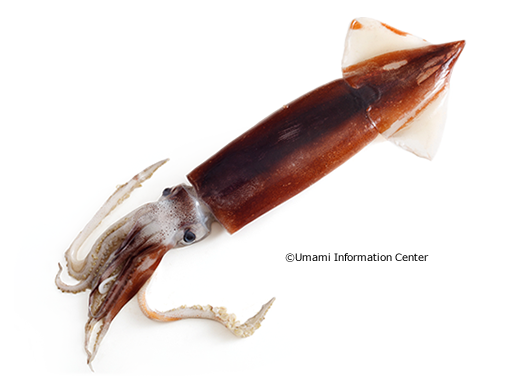 Squid has a small amount of inosinate, a nucleotide. With no scales or shell, octopi can change the color of their bodies depending on the environment around them using pigment cells on the surface of their bodies. Japanese people are deeply familiar with octopus as a food, but as a fish without scales, it is known internationally by the nickname devilfish. The regions where it is used in cuisine are limited, such as Italy and a small number of other countries. 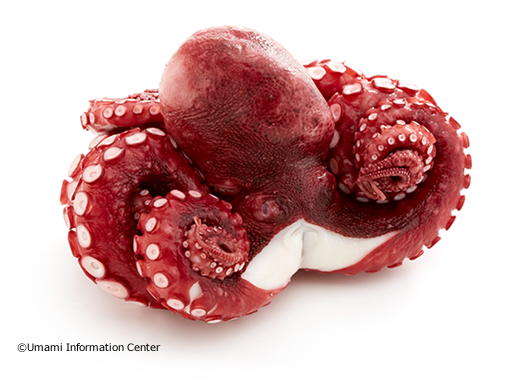 In addition to glutamate, octopus contains other umami compounds such as adenylate (about 1/8 the umami strength of inosinate). Cooking together with ingredients rich in glutamate, such as tomatoes, creates a synergistic effect. A fish belonging to the Carangidae family whose name changes as it grows larger. 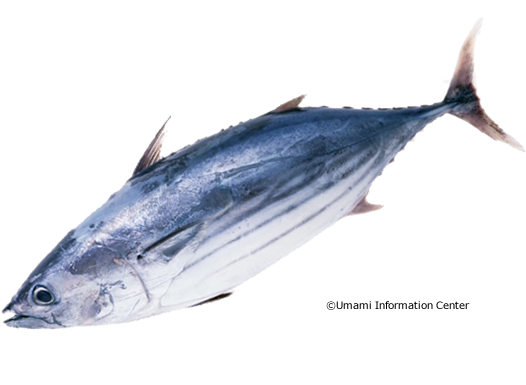 Migrating seasonally along the Japanese coast, the buri in winter are known as “kan-buri.” They are fatty and delicious. These fish are rich in unsaturated fatty acids. Hamachi (buri) contain a lot of inosinate, an umami compound. Stored in ice (0℃) to slow the decline of this inosinate, buri can be enjoyed for approximately one week. Abundant in unsaturated fatty acids such as DHA and EPA, this fish has long been treasured around the world as an important source of nutrients. Particularly famed are the olive oil marinated and salted anchovies found in Italian and Spanish cuisine. For a long time, they have been combined in Italy in Spain with tomatoes, which are also rich in inosinate, in dishes such as pizza, pasta and paella, while in Japan they have featured in tsumirejiru,soup with fish dumplings) and been simmered with ume, Japanese apricot. These are all quintessential umami rich dishes from East and West. Recently, however, stocks have been decreasing to such an extent globally that it said that the humble sardine may go from being a fish of the masses to being a delicacy. 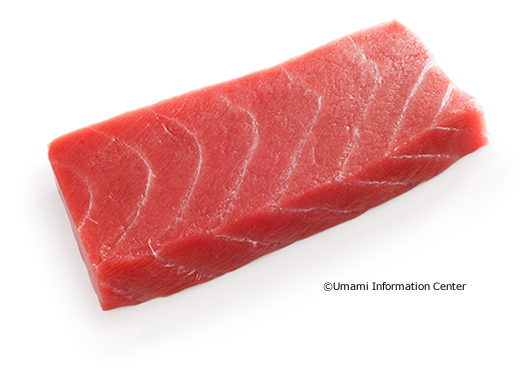 The term tuna encompasses a number of varieties of fish from the tuna sub group of the mackerel family. Tuna is found in oceans worldwide, and is enjoyed everywhere. 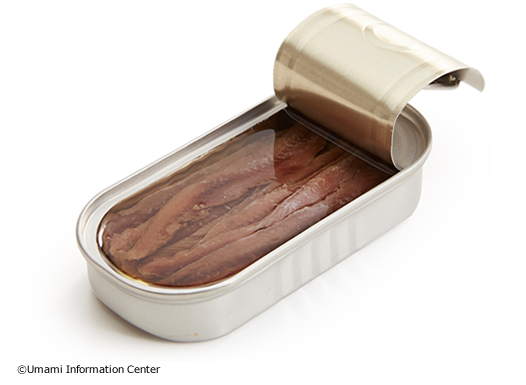 As well as being eaten as sashimi and in sushi, it is also famously processed and sold in cans. High levels of inosinate are found in the red flesh of the fish. Due to the worldwide boom in popularity of sushi, available stocks are diminishing, and this is becoming a cause for concern around the world. General term for a number of sea fish of the bream family. The sound of “tai” means auspicious in Japanese, so it is a popular ingredient for congratulatory food. This versatile fish can be prepared in numerous ways, including as sashimi, salt grilled, simmered, marinated in kombu, baked in casseroles and mixed with cooked rice. 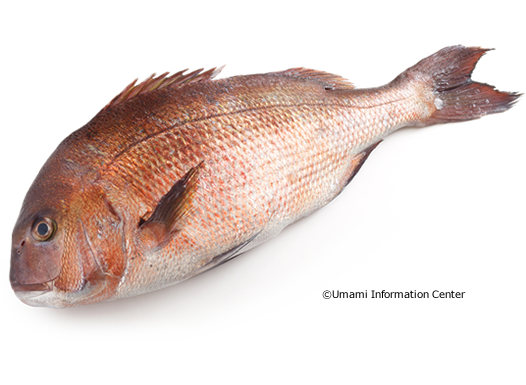 Because the inosinate contained in sea bream does not readily break down, it offers an umami rich taste. A fish that inhabits tropical and temperate areas around the world and is widely eaten. 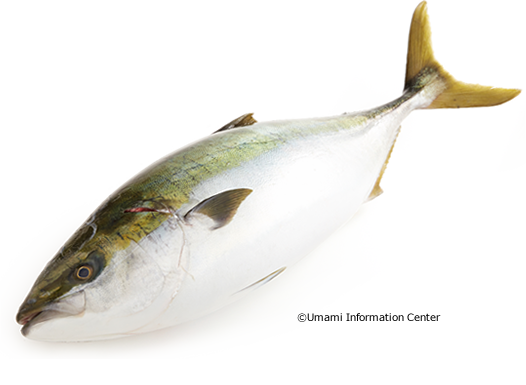 Aji includes about 50 varieties of fish, including the Atlantic horse mackerel, horse mackerel, etc. Most of the aji caught in Japan are Japanese horse mackerel. These are characterized by sharp, hard scales known as seigo. It contains a large amount of the umami compound inosinate. 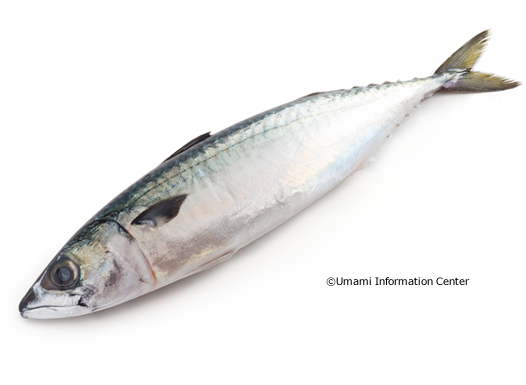 Katsuo is in the family of migratory fish in the Pacific Ocean which go up north from Kyushu to southern Hokkaido in the spring and go down south in the autumn. ”Hatsugatsuo”, the first bonito in the year is caught in early summer and is cherished for its lower fat and light taste. “Modori gatsuo”, the bonito returning from the north and caught in the autumn contains more fat. 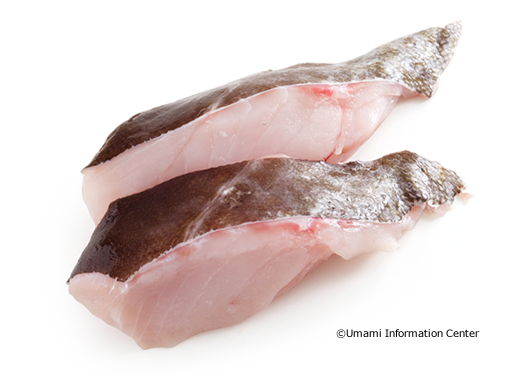 Caught by big-scale offshore fishing vessels, bonitos are quick-frozen on board so that they can be eaten all year round. As well as being served raw as sashimi or tataki (where the outer portion of the fish only is heated), it is also used in simmered dishes and canned. It is used for Katsuo bushi and is abundant in inosinate. 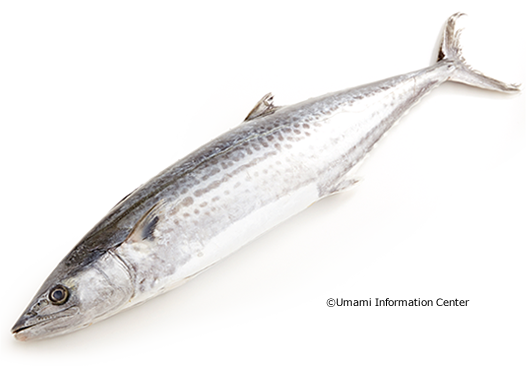 Sawara is a white fish containing 7-10% fat, a slightly high percentage which makes it a tender fish. This is a fish whose name changes as it grows larger; up to 50cm it is called sagoshi, up to 70cm nagoshi, and sawara beyond 70cm. It inhabits areas from the south of Hokkaido to the Korean peninsula, as well as off the coast of Australia. In the winter, it moves deeper underwater, where it grows fatty and tastier. In the spring it moves into bays to spawn, and this is when many are caught. This is why it is written as “the spring fish” in Chinese characters. It contains a large amount of the umami compound inosinate. This popular sea fish is caught and eaten the world over. Because it has a tendency to lose its freshness relatively quickly, and its fishy smell is quite noticeable, it is more often than not eaten cooked in some form or other, for example smoked, vinegared, salt-grilled, and simmered. Specimens caught in autumn and winter in Japan tend to have a higher fat content and are rich in inosinate and, consequently, umami. A general term for a number of species of the cod family. The taste is subtle. Decomposing of inosinate is faster than in any other fish. It is often cooked with other flavours, for example in simmered dishes. It is also often fried, such as in the British dish fish and chips, and the Fillet o’Fish burger. The general term for a number of varieties of bivalve. 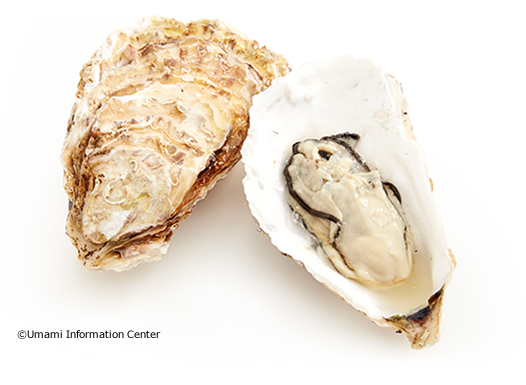 The oyster has long been prized around the world as a seafood that can be enjoyed raw. Oyster sauce, meanwhile, is an umami rich condiment, high in glutamate, that is used in Chinese cuisine. Oysters are in season during autumn and winter, and during this time the umami levels are increased. Such is the level of nutrients they offer that oysters are sometimes referred to as the ‘milk of the sea’. As well as containing amino acids they also offer high levels of zinc, and can also help enhance your sense of taste. Raw material for Chinese seasoning, oyster sauce. 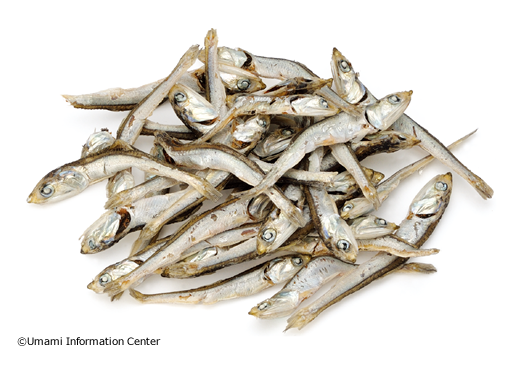 Dried shirasu, mostly juvenile Japanese sardines and Japanese anchovies, is made by boiling the fresh fish in salt water or by steaming, then drying them. These contain the umami compounds inosinate and glutamic acid. 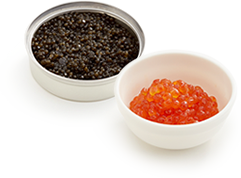 As time elapses, the amount of the umami compound inosinate falls in raw fish. But by applying heat soon after the fish are caught, the movement of enzymes that break down inosinate is suppressed. This means much of the inosinate remains in the fish. 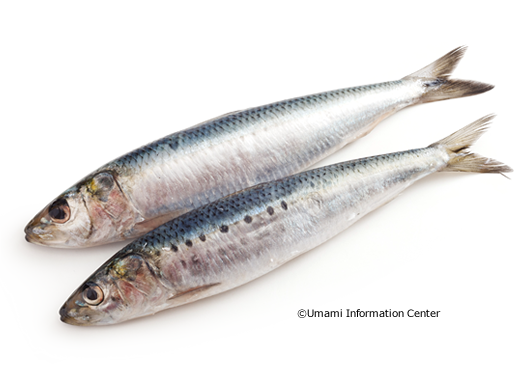 Anchovies are filleted, salted, matured then marinated in olive oil or sunflower oil. While the inosinate is decomposed and disappears during this period, the protein is decomposed by maturation into amino acids such as glutamate. Thus, it becomes a umami-rich food. It imparts saltiness as well. A small amount of anchovies in Italian cuisine such as pasta and pizza enhance umami and enrich the taste of the dishes.